La gráfica representa la cantidad de unidades TLT-2H en el centro de servicio Wialon en los últimos 30 días. En el centro de servicio Wialon se utilizan 68 unidades TLT-2H — es 0.01% de la cantidad total de dispositivos Automóvil conectados. ACC OS - Move alarm. The car engine is Close the car is moving. ACC RS - Move alarm. The car engine is Close the car is move back. ANSWER - Somebody call the tracker, and answer. AUTO - Position information in fixed time and the ACC is ON, engine is Open. ATUO START - The engine is Open, ACC is ON. AUTO STOP - The engine is Close, ACC is OFF. AUTOLOW - The engine is Close, ACC is OFF. CALL - Somebody call the tracker, and no answer. DEF - Cut the power wire. LP - The power low. OVER SPEED - The tracker speed over the set. SOS - Press SOS button. STORAGE - Upload the location data in the tracker. 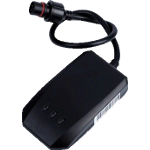 You can also download an example of object configuration file for TLT-2H to be used in Wialon GPS tracking software. When creating an object, import this configuration file by selecting "Import from File" option. This way you will create a pre-configured object with some sensors. Do not forget to specify the unique Id of Your device.